It's Thursday night, and I've just arrived at my second event for the evening: the launch of a new health- and tech-focused mattress brand. After the publicist excitedly spells out the features of the mattress (Wi-Fi–enabled, impressive), she takes me to try a "sleep cocktail" and then to have my palm read. This is my second occult-ish experience of the night—I just left an activewear launch in Tribeca where a tarot card reader counseled me on stress and my “grounding chakras." Yesterday, I received an invitation to a lipstick launch complete with a witch-led workshop on casting love spells. Next Tuesday I have a Victoria's Secret event during which the invitation promises attendees will have the opportunity to "shop the latest Dream Angels collection" and "have [their] auras read." I'm not telling you this because I like to overshare my agenda. As an editor, I've always found health and beauty media launches to be a breeding ground for the next big wellness trend. I remember coconut water and chia bowls being served at fitness studio openings long before both landed on hip and healthy cafe menus. Smoothie bowls were eaten at just about every launch throughout the final months of 2015 before they really blew up on Instagram. Now, it seems witchcraft—and in fact, everything occult—is infiltrating the mainstream wellness space. Women, wellness, and witchcraft have been intertwined for ages—since before the Bible. There's a long and troubled history here: Witches were essentially herbalists, midwives, and healers (it's believed they even provided holistic methods of contraception and abortion) until the patriarchy and Christianity brutally spun witchcraft as evil. Violent witch hunts convulsed Europe throughout the 15th to 17th centuries, killing millions of women—some feminists even question whether witch hunts were really just women hunts—until the 1700s. Fast-forward to the 21st century and a political climate in which threats to women's reproductive health rights are a major talking point, and we also see witchcraft gearing up for a resurgence. Self-proclaimed modern witch, and owner of home and healing store Hauswitch, Erica Feldmann says this timing is no coincidence: While a politically motivated feminist movement grows and also becomes increasingly inclusive, she says, "the witch is a good archetype of that strong, powerful, gives-zero-f*cks attitude that women are trying to channel right now." More insiders I spoke with expand the concept of modern witchcraft to not just include traditional ideas of herbal healing and holistic medicine but also other less tangible ways to spiritually and physically recharge in times of political uncertainty: crystal healing, energy healing, tarot card chakra work, meditation, spell casting, smudging, lunar rituals, and astrology. Essentially, it's all about self-care—something even the most cynical person can get behind. Ahead, we break down five ways to integrate a little witchcraft into your wellness routine. Emily Thomas, witch and founder of Sanctuary 3, a space for magic, crystals, and alternative medicine, wants you to rethink spell casting. There will be no cauldrons; expect no cackling. Instead, this modern breed of magic centers around mindfulness and being intentional about how you spend your time. "The wellness community is becoming a spell-friendly place because we're more and more interested in attaching mindfulness and meaning behind what we do," she told me over email. "Why take a regular bath when you can infuse it with sea salt and herbs for energetic purification after a bad day? Why not channel a meditation toward the well-being of your friend who is sick?" An easy thing to do at home that Thomas says can bring a little magic into your life and open yourself up to love and romance is to blend a few drops of rose, ylang-ylang, and jasmine into a base oil like jojoba or sweet almond oil. "If you can get your hands on some crystal chips, put some charged emerald and rhodochrosite into your mixture," she suggested. Use it to massage your body or to make candles. "The essences of rose, ylang-ylang and jasmine all work toward opening us up to feel love. They're connected to the element of water, which supports connections, beauty, and healing," Thomas explained, adding that emerald is a favorite for "releasing our fear of being vulnerable to others” and is a “potent unblocker for good vibes coming in and out." It's 2017, and "Fitcraft" is an actual thing that exists—only in Brooklyn, admittedly, but I bet it starts to catch on in other major cities. Led by self-titled "fitness witches" Shanda Woods and Russ Marshalek of New Jack Witch, the class combines yoga, rituals, personal training, "ecstatic dance," meditation, and "f*cking great music" for a workout Russ says will make you "sweat, connect with yourself, [and] be empowered." So why the need to mix fitness with witchcraft? It's all about empowerment through exercising the body and mind. Russ explains, "In the current sociopolitical climate, empowering others to live their best lives through self-actualization and self-improvement—witchcraft and fitness—[is] incredibly important and, well, empowering. Also, exercise is a ritual; it's a spell; it's an actualization of self," he told me. If you can't make it to BK for a class, Russ says you can integrate the basic concept into your own workout regimen by "[setting] an intention at the start of the workout that you draw on to push yourself. Focus on breath and repetition, as that mindfulness is what grounds the practice in ritual, and be grateful for your body." In case you haven't realized by now, modern witches are very into sending out and receiving good vibes. And one way to do that, says Feldmann, is to spray a crystal-infused concoction of essential oils around you. "The first product I ever stocked in the Hauswitch store and one of my personal favorites is called Boundaries in a Bottle," she told me. 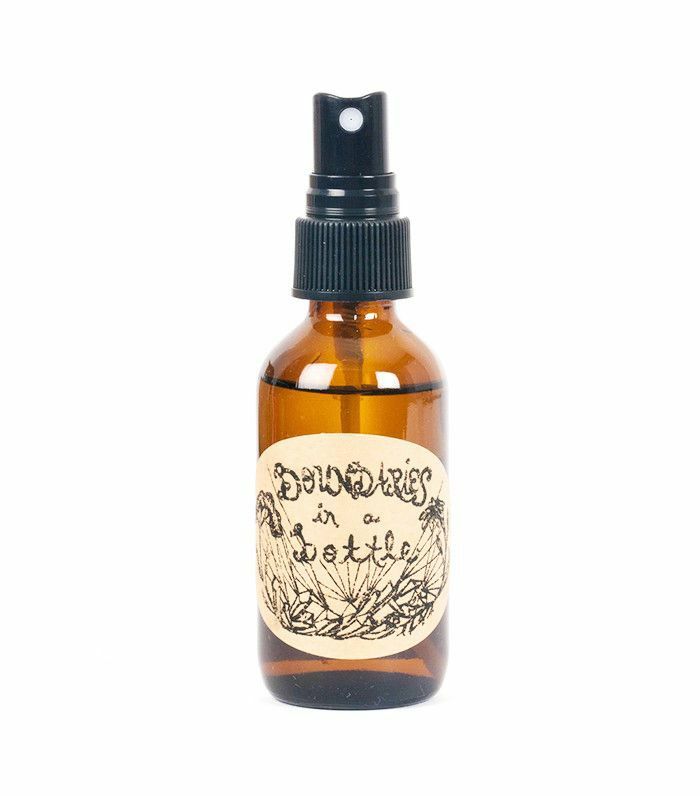 The spray is witch-crafted on the full moon eclipse to "purify and protect you and your surroundings" with essences of black tourmaline, smoky quartz, yarrow, devil's club, echinacea, and other "magical gem and plant essences." Basically, you spray it whenever you're coming into contact with other people and don't want to absorb their bad juju. Before you roll your eyes—and yes, I know it's tempting—even if you don't buy into energy healing and the power of good vibes, remember that the very act of being intentional about your own positive energy can go a long way toward making you feel good. And hey, it's also scented, so at the very least, you'll smell great. Is there anything more achingly millennial than having a healer use tarot cards to unblock your chakras? Melinda Lee Holm is a tarot reader, jeweler, and crystal guru with 25 years of experience in the metaphysical arts and, unsurprisingly, is also mega fan of using tarot to bust stress, achieve your goals, make good decisions, and bring positive energy into your life. "Calling on tarot archetypes to light up energy centers can be extremely effective, especially in combination with candle work and crystal therapies," she told me. Specifically, if you are feeling confused or unable to make a decision about something important, tarot readers will focus on your sixth chakra (third eye) and third chakra (solar plexus). "The third eye is where our intuition comes in, our inner knowing. The solar plexus is where our confidence and sense of self lives. If there are issues here, then even with a keen intuition, we'll have trouble trusting the intuitive answers," she told me. If you want a DIY fix, Holm suggests taking the "High Priestess" card and the "Sun" tarot cards, placing them somewhere in your home or office where you would regularly look, and also taking a few moments to meditate on the images each day. Together, they are connected with intuition and the center of the body. Crystal healing has been slowly working its way into mainstream wellness circles for a couple of years now. The concept itself is simple: Each shiny stone carries different properties that can work to heal the mind, body, and spirit. They also happen to look great in a flat lay, which is probably also why so many wellness bloggers are integrating crystals into their #aesthetic. Seeress and shaman Deborah Hanekamp of Mama Medicine told me that rose quartz is one of her favorites for anyone new to the practice "because it opens us to our love, and love is always a wonderful place to begin." Feldman, on the other hand, suggests meditating while holding dark crystals like tourmaline or garnet to "align your body and energy centers" and feel more grounded. Crystal therapy isn't just limited to meditation. Hanekamp suggests a bunch of ways to incorporate crystals into your life: "Put them in your drinking water, hold them, place them on your heart, sleep with them under your pillow, and put them in your bath." Beauty brands are also embracing the healing properties of crystals, infusing their cremes and serums with gemstones. Take Gemstone Organic Organic Rose Quartz Skin Créme ($37), for example, which claims to bring the user "loving energy" while also hydrating skin, or Glow by Dr. Brandt Ruby Crystal Retinol Hydracrème ($65) that incorporates "micronized ruby crystals" to "revitalize skin" and "blur imperfections." Of course, if you would like to save yourself $60, you could just style a geode on your desk, 'gram it, and call it a day. What's your take on witchcraft wellness? Are you for or against it? Tell us in the comments!